The U.S. cheese industry embodies a legacy of hundreds of years of excellence stemming from a melting pot of backgrounds and cultures. The vast multicultural experiences brought to the U.S. by immigrants have fostered a deep history of outstanding cheese making. Today, this heritage of experience and knowledge, combined with efforts of talented and creative cheese artisans all across the U.S. pushes traditional limits toward new and elegant cheese flavors. This ‘Unbound by Tradition’ renaissance has dramatically increased recognition of the U.S. cheese industry in markets around the world. Contributing significantly to the excellence of U.S. cheese products is the highly diverse topography of the U.S. From the rolling hills of New England, to the vast open prairies of the Plains states, to the unique and dramatic beauty of the West Coast, it is no wonder that the outstanding craftsmanship of U.S. cheesemakers results in tremendous variety and versatility of U.S. cheeses. 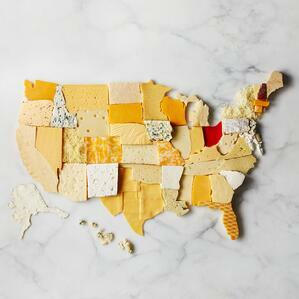 Because U.S. farmers dedicated to a sustainably-produced milk supply are found across all 50 U.S. states, highly touted, award-winning cheeses come from well-known cheesemakers across the country. While states like Wisconsin and California are traditionally recognized for their cheeses available around the world, other states such as Vermont, Oregon, South Dakota, Idaho and New Mexico also contribute to the innovative, flavorful varieties being increasingly enjoyed outside of U.S. borders. But even with this growing success—the increasing recognition of the U.S. as the leading global supplier of the highest quality dairy products including specialty cheeses—ongoing efforts are in place toward further improvement and expansion. Investments in research and additional innovation in our industry, combined with the long, rich heritage of skilled craftsmanship, continue to drive us forward. The craftsmanship, innovation, variety and versatility of U.S. specialty cheeses are world class; they aspire to complement local cuisines everywhere. Stay tuned as we bring these characteristics to life by highlighting various aspects of the U.S. cheese industry. Visit ThinkUSAdairy.org for more on the advantages of U.S. Dairy.